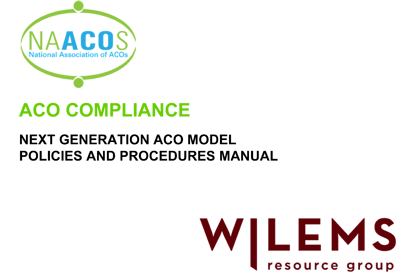 Purchase Your ACO Compliance Manual Subscription and Get Started! 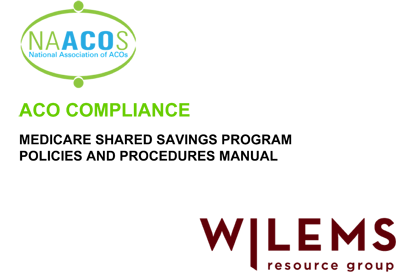 NAACOS has partnered with Wilems Resource Group to offer MSSP and Next Gen ACOs a Compliance Manual consisting of a robust set of policies and procedures your ACO can customize to meet your individual needs. Why should an ACO purchase the manual? ACOs are required to meet a large number of state and federal regulatory requirements, including health care fraud and abuse laws, privacy requirements, and the specific requirements of CMS. This manual is a necessary tool designed to provide template policies to help your ACO’s leadership determine the best “next steps” for the ACO and implement procedures to ensure compliance with program requirements. Your ACO may have purchased a previous version of this Compliance Manual. If so, upgrading to this newest version will provide additional compliance and operational insight, as well as the addition of required policies around care coordination, beneficiary engagement, internal reporting on data and analytics, marketing material requirements, and more! The new and improved Compliance Manual will be available on a subscription basis that will be renewed as necessary based on the release of updated regulatory guidance, but at least every 12 months. Everyone who subscribes to the manual will receive any updates made during the subscription year. To order the manual, please click on the appropriate link below. Already Purchased? Login and begin editing! Please note: The forms generated by the compliance manual will have a watermark in the footer indicating the subscription expiration date and version number as well as "NAACOS". See below. For information about becoming a member, please visit our member page. For those who already purchased the manual, login and begin editing!